To provide customers with the contact information of their primary assigned sales representative, enable the display of the sales rep contact information in the Oro application storefront footer links. Contact information can be configured on four levels: globally, per organization, per website, per user. Website settings override organization, organization settings override system and user settings may (sometimes) override all other settings, depending on configuration. In these cases, either customer owner or customer user owner may be used as a user settings source. Website settings can fall back to the system settings. 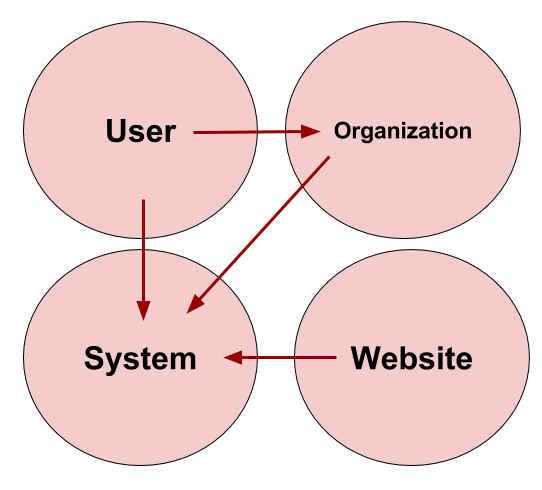 When Use System check box is enabled, system settings override website or organization. When Use Organization check box is enabled, organization settings override system. With this in mind, we will have a look at how sales representative information is configured at each level. Enabling sales representative information globally sets system settings as default ones. Select Commerce > Sales > Contacts in the menu to the left. Don’t Display Contact Info – no sales rep information is displayed. This option is the default one. Customer User Owner – allow customer user owner information to be displayed. Customer Owner – allow customer owner information to be displayed. User settings override all other settings if Customer Owner or Customer User Owner are selected as a display option. Pre-configured – in the Contact Details text field, specify custom contact details you wish to be displayed. Options selected as Available User Options determine what options the user will see in the Customer Visible Contact Info list in their user configuration settings (in My User > My Configuration > Commerce > Sales > Contacts > Customer Visible Contact Info). Don’t Display Contact Info – allow setting the option of no sales rep information to be displayed. If the admin enables the Available User Options check box and sets the Don’t Display Contact Info option, then the user will see Don’t Display Contact Info in their configuration settings. The user who will be able to see these settings is the one selected in the Display list. User settings apply when either customer user owner or customer owner is selected. Use User Profile Data – allow setting the option of user profile details to be displayed. If the admin enables the Available User Options check box and sets the Use User Profile Data option, then the user will see Use My Profile Data in their configuration settings. Enter Manually – allow to set the option of manually entered text in the Enter Contact Info field. If the admin enables the Available User Options check box and sets the Enter manually option, then the user will see Enter Manually in their configuration settings. You can choose to use multiple options by holding Ctrl when selecting the option. When all options are selected in Available User Options, the user will see them all in their configuration settings as well. Please note that Allow User Configuration options define user level settings only. In the Guest Contact text box, you may enter contact information that will be shown to non-authenticated visitors. For the necessary organization, hover over the More Options menu to the right of the necessary organization and click to start editing the configuration. In the Display list, select one of the options that will determine what and whose information to show on the website. For options detailed description, see Set Display Options. Such organization settings override settings set at the system level unless Use System check box is enabled. Select one or more Available User Options. In the Guest Contact text box, you may enter contact information that will be shown to non-authenticated visitors. Click Use System to use the text configured at the system level. For the necessary website, hover over the More Options menu to the right of the necessary website and click to start editing the configuration. Select Commerce > Sales > Contacts in the menu on the left. In the Display list, select one of the options that will determine what and whose information to show in the storefront footer links. For options detailed description, see Set Display Options. Such website settings override settings set at the system level unless Use System check box is enabled. 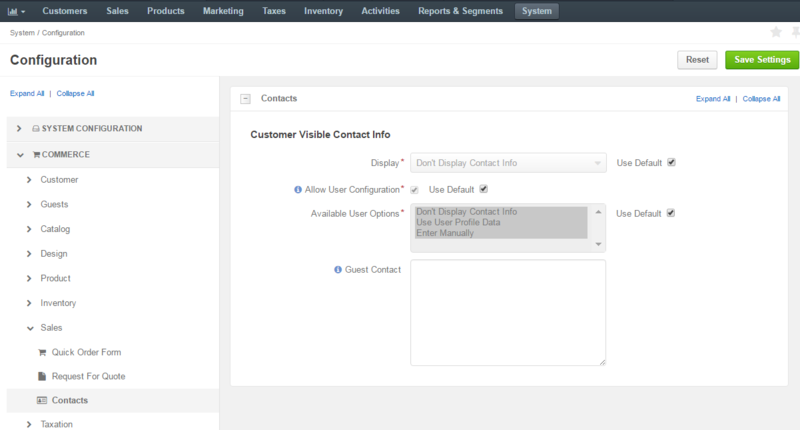 To locate user configuration settings, navigate to My User > My Configuration and click Commerce > Sales > Contacts in the panel on the left. In the Customer Visible Contact Info list in their user configuration settings, the user will see the options that are enabled and selected in Available User Options on the system, website or organization levels. Don’t Display Contact Info – do not display any sales rep information. Enter Manually – display contact information that is manually entered in the Enter Contact Info field. Use System – fallback to system settings. The option is available only when the Display setting in the system configuration is set to Pre-Configured. Use My Profile Data – display the user profile details as a contact information. User settings override all other settings only if Customer Owner or Customer User Owner are selected as display options. To fall back to organization settings, enable the Use Organization check box. In the Enter Contact Info field, provide custom text to be displayed. This text is used as a contact information only when the Customer Visible Contact Info setting is set to Enter Manually. The following configuration example is provided for illustration. As an administrator, you were asked to set up the ability for a customer sales representative John Doe to provide contact information for non-authenticated and logged in customer users. Navigate to System > Configuration > Commerce > Sales > Contacts. In the Display list, select Customer User Owner. Enable Allow User Configuration check box, and select all three available user options from the list. This information should become available on the website for non-authenticated users. To set information for logged in users, you need to make sure that in the system configuration, the settings allow John Doe as a customer user owner to enter his contact information manually in his user configuration. Navigate to My User > My Configuration > Commerce > Sales > Contacts. 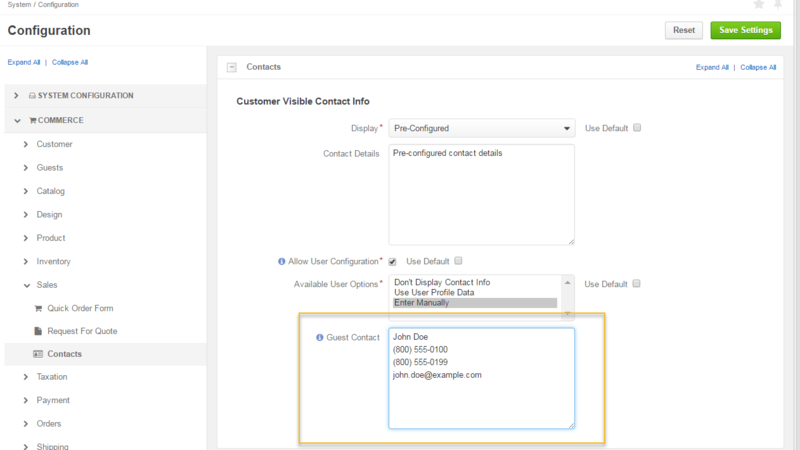 Select Enter Manually in the Customer Visible Contact Info field. Provide contact details in Enter Contact Info, e.g. The information should become available on the website.